animals that have lived in the White House. Perfect read for the presidential year. Many different animals have lived in the White House, and not only dogs, cats and goldfish, but also elephants, horses, ponies, alligators, cows, bears, a foul-mouthed (or foul-beaked?) parrot, sheep, tigers, silkworm, and more. 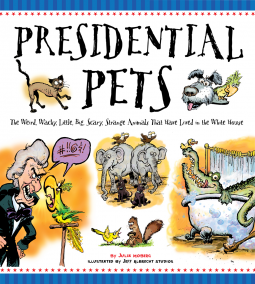 Each president is introduced with his pet or pets with a short poem, and then other interesting facts are provided about the pet, and the president's term. I enjoyed the book, it is interesting and amusing. I would not recommend to read it from cover to cover in one seat, since it might weaken the effect, and become repetitive, but a couple of presidents a day sounds like a good approach. The illustrations are very humorous too. Great non-fiction option to get kids interested in social studies topics.